If this 'novel' had been written in verse form it would have been easier to assess, for the prose virtually scans, the images come crystal clear, the concepts have the almost fragile quality of poetic imagery. As a novel, one is somewhat at a loss, for the plot- if such there is -- lies in the search of Adam Rosenweig for 'what a man must know to be a man'. The fight for freedom -- that was his creed, inherited from the father who betrayed it on his deathbed that he might die in his faith. The right to fight, despite his club foot, despite the insistence of his uncle that as a Jew he must stand aside and wait, despite the unsavory reputation pinned on Germans as fighters, because one company fled at Chancellorsville. And so Adam signed up, his deformity unnoticed, until the sea betrayed him to the officer in charge of recruits, as the shores of America seemed almost within reach. He escaped -- in the turmoil of New York; he found a way to serve- as aid to a sutler. He learned -- through seeing death, experiencing man's betrayal of himself and his fellows, finally through killing a man himself, on the battlefield. He knew he was ready then to walk out of the Wilderness. 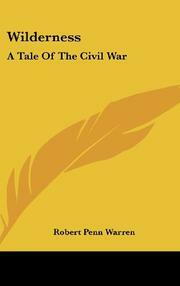 Here-as only Robert Penn Warren could do it- is another aspect of the Civil War.